Following on the heels of yesterday's announcement of the Empire Avenue Mentors Program, we're also now announcing Empire Avenue Premium Services. With this change, Empire Avenue will have five account levels as detailed in the table below. Should you not move to a Premium level, much of what you do today for free will not change. Adding Premium levels will not mean we stop development on features that will be delivered for all, instead where we feel a feature can be improved in a premium setting then we will add it to a particular level. The new Premium service accounts will be monthly subscriptions with the following levels, Bronze, Silver, Gold and Platinum. Please note that our Platinum level will be aimed for the corporate/business world for the most part and as such will likely get additions aimed at that customer base. Our intention, over time, is to expand each level with more and more analytics from your social networks, analytics on your Empire Avenue experience and features that will help each level realize real value from using Empire Avenue. 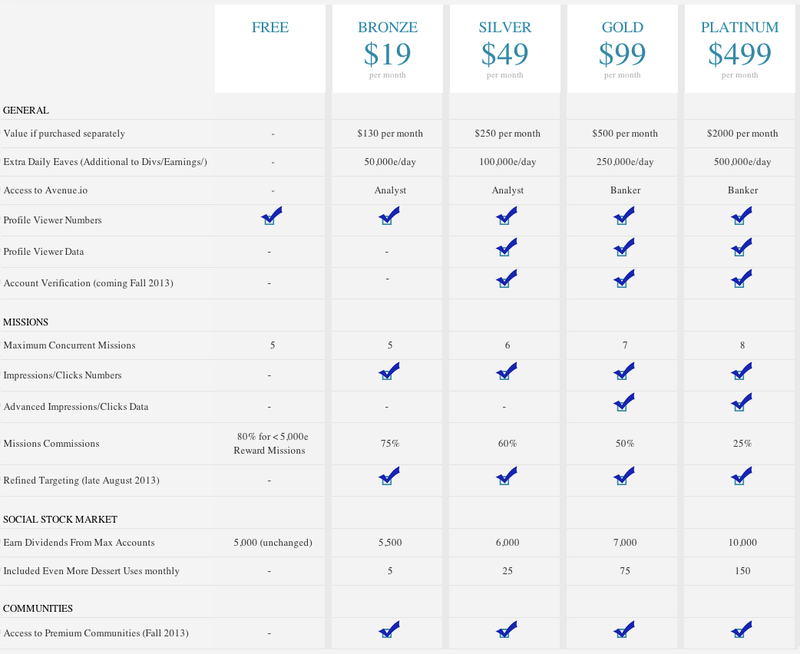 The graphical table below breaks down what each level will offer extra beyond a standard "free" account. We will be offering these Premium Levels to existing members of Empire Avenue at a discount so keep an eye out and make sure your email address is updated on the site! We are pleased to announce a partnership with Avenue.io as part of of the Premium Services. We know that many of you use Avenue.io to track your portfolio for the stock market. We appreciate that services such as Avenue.io, while not part of the main product for complexity reasons, do provide considerable value to certain members. Avenue.io and Ben Arledge hail from our home town in Edmonton, Alberta and we are looking forward to working together. When you buy access to a Premium Service level, Avenue.io will be included at an appropriate level. We hope this will be one of many such partnerships with individuals and companies who have used our API to come up with interesting applications. 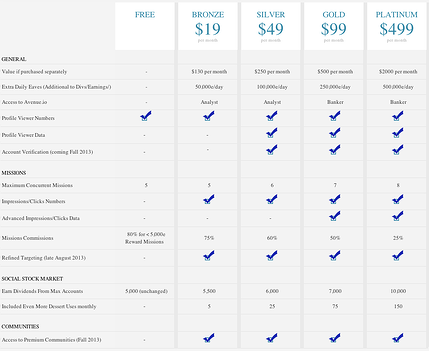 Existing Avenue.io customers will get the opportunity to upgrade to one of these packages or stay where they are. We have been working with Avenue.io on how best to handle that over the coming week and will have more details as we begin the rollout. Our expectation is to release Premium Services between August 5th and August 8th. Comments and feedback welcome in the Empire Avenue General Discussions Community! We fully intend to expand on each of the levels that we have specified here in this grid. The Benefit to having a Premium Access account will be for those that want to get more out of the data and features that we currently have or are building in the future. We are targeting Premium Services to those that have reached a certain level in their Social Media and want to use our data to be better, for those using Empire Avenue as a network in and of itself. At the highest level we will work with companies to understand how to make that level work. With feedback from the Community (thank you) we have made some modifications based on what we heard. We appreciate those that gave us balanced and reasoned feedback. 1. Maximum Mission Rewards: there will be no restrictions on what kind of reward you can offer as we had with the first iteration of Premium Services. All accounts will remain being able to do Missions up to 50,000e as a reward. We will not remove the ability from those accounts now or in the future. We will instead concentrate on making sure that Refined Targeting for Missions gets in as soon as possible. 2. The Mission Commissions reductions were hard to understand: We have made them single values, except for Free, where you will continue to get 80% reduction on Missions of 5000e or less. At Gold for example, your Missions would carry a fee of 50% of the Reward value across the board. 3. We've added a couple of line items that are being worked on. Initially we did not add those in as we only wanted to put stuff that was ready, but it is very clear you want to see what is in the pipe. These are Account Verification for Premium Accounts (this may also come as a one-time fee and the process is still being worked on), Premium Communities (lots here and you'll hear about it separately), Refined Missions Targeting (something everyone has been asking for and again lots here).